Summer of Love is a ground-breaking exhibition which reveals the unprecedented exchanges between contemporary art, popular culture, civil unrest and the moral upheaval during the 1960s and early 70s. The art and culture of the psychedelic period constitutes one of the most exciting but also much neglected phenomena of the twentieth-century. Moving beyond a purely nostalgic reception, Summer of Love attempts to uncover this forgotten and repressed aesthetic that continues to exert an increasingly powerful influence on many contemporary artists. The exhibition reconstructs the original creative and utopian potential of psychedelic art and locates it within the wider cultural and political context of the 1960s and early 70s, presenting it as an international phenomenon with works from the UK, United States, Europe and Japan. It demonstrates how artists were deeply entrenched in popular culture, influenced by the mind-altering effect of drugs and participated in counter-cultural activities. The inclusion of psychedelic art created by major figures such as Andy Warhol and Yayoi Kusama illustrates the critical role of psychedelia within the contemporary aesthetic discourse, providing a complex and more comprehensive picture of the art and culture of the 1960s. The psychedelic aesthetic manifested itself in all aspects of cultural production, ranging from art, music and film to architecture, graphic design and fashion. Summer of Love presents a rich selection of over 150 important posters, album covers and underground magazines, in particular from the San Francisco and London scenes. The exhibition includes paintings, photographs and sculptures by, amongst others, Isaac Abrams, Richard Avedon, Lynda Benglis, Harold Cohen, Richard Hamilton, Jimi Hendrix (his only known painting), Robert Indiana (his celebrated Love signs), Richard Lindner and John McCracken. Numerous long-neglected artists are represented with rarely seen or specially reconstructed works and installations. Major environments include Mati Klarwein’s New Aleph Sanctuary 1963-71, which brings together many of his motifs (which he also used in his designs for Santana album covers) in a spectacular installation. Experience Vernon Panton’s colourful and amorphous furniture landscape and Janis Joplin's original psychedelic Porsche on its first trip to Europe. A special emphasis is placed on environments as well as film, video and multimedia installations, replicating the total experience of psychedelic light shows and music performances. Andy Warhol appropriated the use of light shows and film and slide projection for the Exploding Plastic Inevitable and The Velvet Underground. Major film installations include a room with multiple projections of the Boyle Family’s films, first used in light shows for the psychedelic band The Soft Machine and a liquid crystal projection by Gustav Metzger. The medium of film is integrated into the exhibition through large-scale projections including works by Lawrence Jordan, Stan Vanderbeek, Andy Warhol, James Whitney, Jud Yalkut and Nam June Paik. 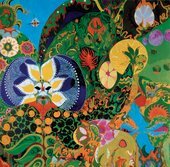 Summer of Love: Art of the Psychedelic Era will tour to the Kunsthalle Schirn Frankfurt from 2 November 2005 – 12 February 2006 and Kunsthalle Wien from 5 May – 3 September 2006.